Simply put, an Ignition Interlock Device is a breathalyzer for your vehicle. It requires you to submit a breath sample into the Ignition Interlock Device before starting your car and helps you to drive safely by not allowing your vehicle to start if you are under the influence of alcohol. ​A handheld unit in which the breath sample is submitted into. All activity is stored in the device and sent to your monitoring department (court, DMV, probation officer, etc.). With real-time reporting capabilities, Intoxalock is able to upload data immediately to our Log Reporter website. Some states require the information to be made available immediately, while others require the data to be sent monthly. Monthly Calibrations available at all PPS locations upon appointment. 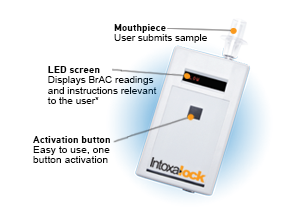 Click here to get started, and have an Intoxalock representative contact you today!